The standard speakers in a Jimny are rubbish. Not only that but the drivers side one is prone to getting water on it from both the drivers feet and water coming down the inside of the A-pillar from both Windscreen and Aerial mount leaks. Ours had become intermittent and when I pulled it out the terminals were heavily corroded. 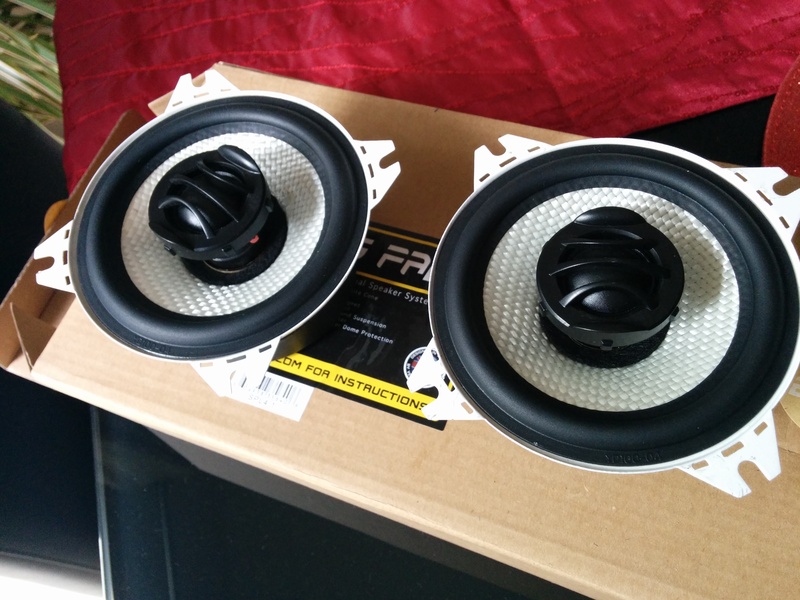 I did not want anything too fancy so Ebay revealled a pair of 4" round speakers that are a direct fit. All I had to do was cut and replace the wiring connectors on the ends of the Suzuki wiring. The panel that covers them is secured by a single plastic press stud that "un-screws" with a Philips screwdriver,turn it until it pops out. Then wiggle the panel out, the door strip holds one end in place so lifting the end of this will help.